Nuremberg. 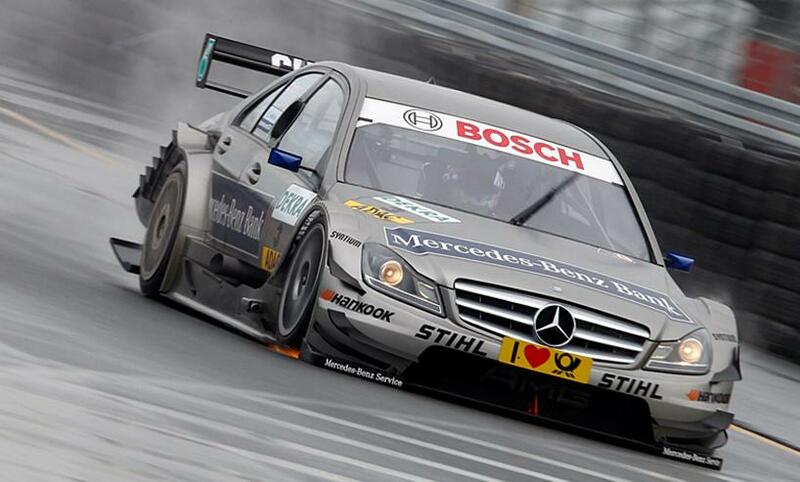 Mercedes-Benz scored a 1-2 in the fifth DTM season round at Norisring. At the only street circuit on the DTM calendar, Bruno Spengler won from his fellow Mercedes-Benz driver Jamie Green. With his second victory of the season, Spengler also claimed back the lead in the points’ standings. Martin Tomczyk (Audi) completed the podium, having moved up from tenth on the grid to finish third. Behind Timo Scheider and Edoardo Mortara (both Audi), Ralf Schumacher (Mercedes-Benz) ended up sixth. The race at the 2.3 kilometres long street circuit was stopped after 65 laps due to continuing heavy rain. A full press release with quotes will follow shortly. Info Start behind the safety car due to the rain. Lap 1 Five laps behind the safety car. Lap 5 At the end of the lap, the safety car will pull into the pit lane. Lap 6 Green. Spengler remains in front from Paffett, Green. Coulthard overtakes Vietoris. Scheider past Engel for sixth. Lap 7 Molina collides with Jarvis at Grundigkehre and turns Jarvis around. Lap 9 Tomczyk attacks Engel for seventh. Lap 10 Ekström attacks Green for third, but the Brit defends his position. Lap 11 Nice battle between Tomczyk and Engel. Under braking for Dutzendteich, Engel misses his braking point and Tomczyk gets past. The German is now seventh. Lap 13 Spengler is leading Paffett by 2.1 seconds, then Green, Ekström, Schumacher, Scheider, Tomczyk, Engel, Mortara, Coulthard. Lap 15 Molina battling with Coulthard for tenth. Lap 16 Paffett into the wall coming out of Schöller S.
Lap 21 Mortara is the first driver to come in for his pit stop. Lap 22 Molina into the pits. Lap 25 Rockenfeller into the pits. Lap 29 Battle between Green and Ekström for second place. Lap 32 Vietoris into the pits. Lap 35 Coulthard into the pits. Lap 38 Engel into the pits. Lap 39 Frey into the pits. Lap 40 Engel and Mortara tangle at Dutzendteich. Lap 41 Albuquerque into the pits. Lap 43 Van der Zande into the pits. Lap 44 Scheider into the pits. Incident between Engel and Mortara is under investigation. Lap 45 Spengler, Stoddart, Jarvis into the pits. Lap 46 Ekström and Green battle for second. Partly side by side. Scheider into the pits for his second stop. Lap 47 At the exit of Grundig, Ekström overtakes Green. The Brit counters at Schöller, but Ekström stays ahead. Schumacher into the pits. Lap 48 Green past Ekström again. No further action against Engel or Mortara. Green into the pits. Lap 49 Ekström into the pits. Tomczyk is now the only driver yet to make a stop. Lap 50 Tomczyk into the pits. Lap 51 Tomczyk almost hits the Armco barriers coming out of the pits. Ekström into the pits for his second stop. Lap 52 Tomczyk, Engel, Stoddart, Rockenfeller also into the pits. Lap 53 Frey into the pits. Lap 54 Vietoris, Jarvis into the pits. Lap 55 Spengler, Molina, Albuquerque into the pits. Lap 56 Green into the pits. Lap 57 Van der Zande into the pits. Lap 58 Safety car. Mortara, Schumacher, Coulthard into the pits. Lap 59 All drivers having completed their pit stops, Spengler is leading from Green, Tomczyk, Scheider, Mortara, Schumacher, Ekström, Coulthard, Engel and Van der Zande. Lap 65 Red flag. Spengler wins from Green, Tomczyk, Scheider, Mortara, Schumacher, Ekström, Coulthard, Engel and Van der Zande.